Are you tired of just green beer on St. Patty’s Day? Are you looking for something a little more fulfilling or traditional? Look no further, as we get creative with Irish classics. Enjoy these traditional Irish dishes for St. Patrick’s Day this year! Saint Patrick’s Day is a largely American holiday when we celebrate all things Irish. Brought to America by Irish immigrants, the holiday is one of the most widely celebrated in the country — after all, the Irish-American population is more than seven times that of Ireland. Originally, Saint Patrick’s Day was one of a number of Catholic saint’s days, though this one held special importance to the Irish who took Patrick as their patron saint. A day that is synonymous with drinking in the United States started out a religious day spent largely at church. So, while many in the States spend the day after St. Patrick’s Day praying for relief from their hangover, the traditional celebrators were just praying. So, who was this saint who drove the snakes from Ireland? Well, to start, Patrick wasn’t even Irish. He was a Roman Welsh. That’s not where the misconceptions about Patrick end, either. For example, when we said he drove the snakes out of Ireland, we should really be saying, he drove Paganism out. After returning to Ireland as a priest, he converted much of the population of the island, forever changing its religious makeup. Much of Patrick’s life, though, wouldn’t be out of place in a blockbuster action film. Much of Patrick’s life, though, wouldn’t be out of place in a blockbuster action film. When he was only 16, still living in Wales, Patrick was kidnapped by Irish pirates. These pirates sold him into slavery in Ireland, where he would spend six years of his life. During this time, he turned to Christianity for comfort and hope. He would escape and return years later to convert the population. The way he went about this was fairly ingenious. Instead of changing or outlawing old beliefs of the pagans in Ireland, Patrick would incorporate those ideas into Christianity. This created things like the Celtic Cross and many of the Irish-Christian traditions. It would also bleed into the recording of his own story, which would take on superhuman stories, like one where he turns a village into werewolves. Seriously. Many of you will be familiar with the first dish we’ll cover, though you may not know it. Commonly misidentified as shepherd’s pie in the United States, cottage pie is a combination of vegetables, beef, and mashed potatoes. It’s only truly shepherd’s pie if the protein is lamb or mutton — not beef. 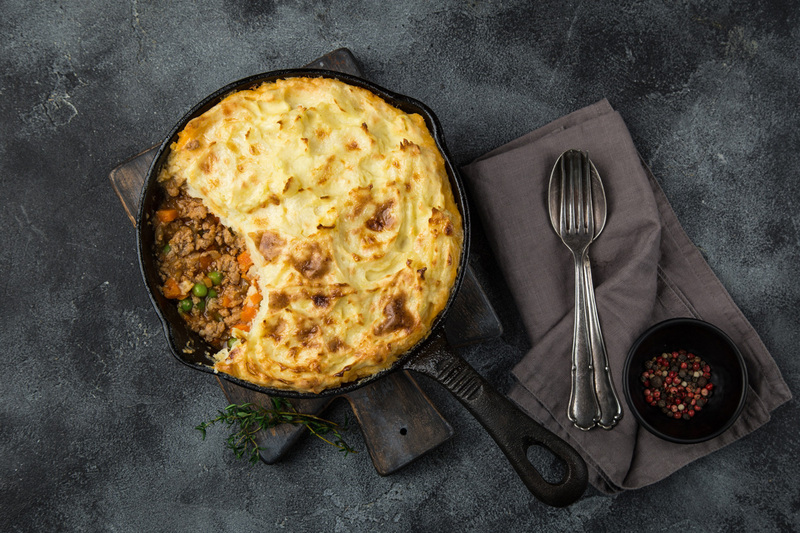 It’s only truly shepherd’s pie if the protein is lamb or mutton — not beef! Cottage pie is a simple, homey dish that’s filling and tasty. That said, it’s definitely not light, with its combination of starches, sodium, and fats. You can chip away at the calories, however. One tweak we’ve covered before is with the mashed potato top. It’s the other ingredients where getting creative is important. Try leaner beef to cut some unnecessary fat and grease. When it comes to the sauce, use a low-sodium or low-fat stock and tomato paste. Especially in the case of sodium, you can add more to taste at the table. Bring roughly eight cups of salted water to a boil. Carefully place the potatoes in boiling water. Bring the water to a simmer at a low heat and cook the potatoes until they’re soft. This should take 15 to 20 minutes. Poke the potatoes with a fork. If it easily pierces the potatoes, they’re good. Drain the water and place the potatoes in a large bowl. Mash the potatoes and salt and pepper them to taste. Mix in the skim milk, margarine, and sour cream. Add in parts, so you can adjust to get the mash to a texture of your liking. Heat the olive oil in a large saucepan and cook the carrots until they’re soft. Add the leeks and onions. Cook until they’re soft. Brown the beef in the saucepan, and drain the fat. Mix in the peas, garlic, and one tablespoon of butter. Allow it to heat through. Add your flour and tomato paste, and mix thoroughly to eliminate any flour lumps. Allow the mixture to reduce over medium heat. Stir in the stock and allow that to simmer and reduce until it’s of a thick, gravy-like consistency. Ladle the filling into a large ovenproof dish and scoop or pipe the mashed potatoes over the filling. Brush the remaining one tablespoon of butter, melted, onto the potato topping. To celebrate this weekend, we’ll also give you a little bit of a treat. For dessert, an Irish Apple Cake won’t be super-healthy, but at least there are apples. This recipe is certainly healthier than other recipes we found, like a traditional Irish whiskey cake or Irish fudge. It’s equally as delicious, though. The problem with baking is that the measurements and ingredients are precise. Baking is the closest to science you’ll get in cooking, outside of molecular gastronomy. This makes healthy alternatives and tweaks very difficult to do without significantly altering the final product. Baking is the closest to science you’ll get in cooking, outside of molecular gastronomy. We retrieved this recipe from the fantastic cookbook “Irish Food & Cooking” by Biddy White Lennon and Georgina Campbell. The following recipe was created by them and we kept the instructions close to the way it appears in their book to give you the most authentic experience. If you want a traditional Irish cookbook that goes beyond the stereotypes, we highly suggest you check this book out. Preheat the oven to 375°F and butter an eight-inch cake tin (pan). Sift the flour, salt, and ground cloves into a bowl. Cut in the butter and rub in until the mixture is like fine breadcrumbs. Peel and core the apples. Slice them thinly and add them to the rubbed-in mixture with the sugar. Mix in the eggs and enough milk to make the flour mixture a fairly stiff dough, then turn it into the cake tin. Sprinkle granulated sugar over the top of the mixture. Bake it in the preheated oven for 30 to 40 minutes, or until it’s springy to the touch. Let it cool on a wire rack. When cold, store in an airtight tin until ready to serve. Happy St. Patrick’s Day, the day when everyone is a little Irish. Cook up a delicious Irish meal, turn on the Dubliners, and crack open a Guinness. It’s time to celebrate the Emerald Isle!